One hundred years this week, on 20 February 1917, the Cork Muskerry Light Railway Company published their report for their annual general meeting in the Cork Examiner. The meeting was held at their offices on Western Road under the chairmanship of Mr George Colthurst (of Blarney Castle estate). The report gives insights into agriculture and the connections from the city into mid County Cork. 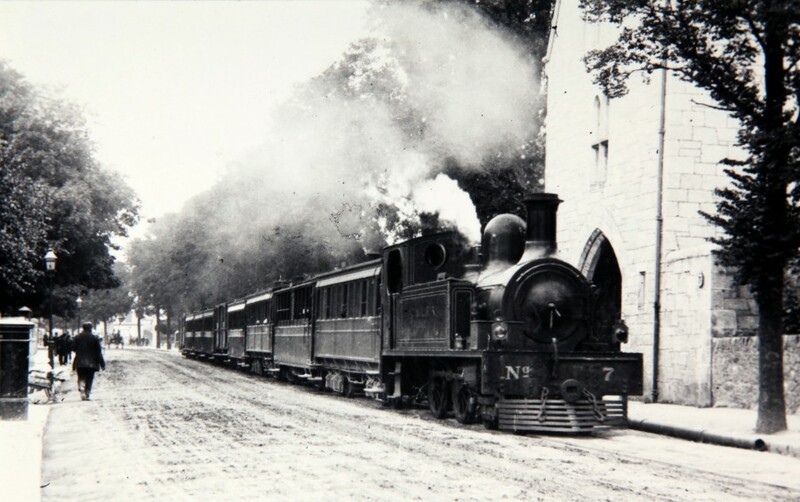 The line was primarily built in the 1880s for tourists to link Cork to the tourist town of Blarney and its historic castle. Supporters of the railway line also aimed to provide improved transport for locals with livestock and farm produce between the farming area north-west of Cork and the city and for coal and minerals in the reverse direction. Beginning on Bishop’s Marsh (now the River Lee Hotel), the Cork terminus was a single-storey building covered by a corrugated iron roof with a long platform. The iron engine and carriage shed spanned three tracks. the first four miles of the line going west were very like that of a tramway. 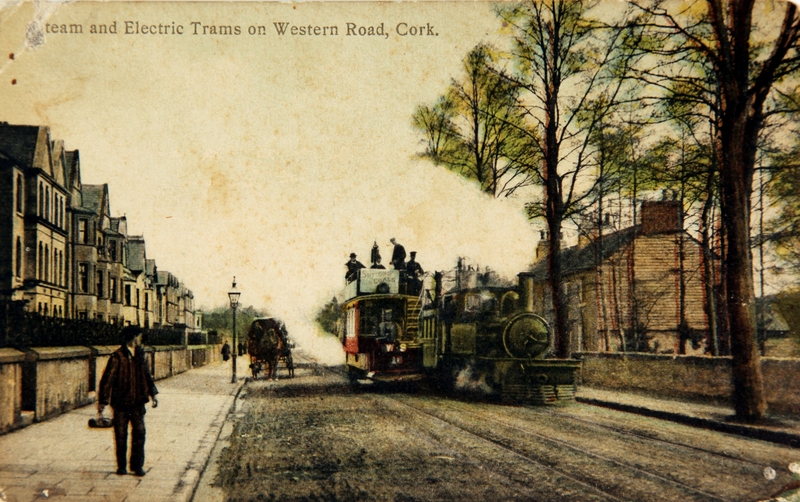 From the terminus, the line crossed the south channel of the River Lee via a small bridge leading to Western Road. The iron supports for the bridge can still be seen. The initial stops were at Victoria Cross, Carrigrohane and then northwards to Leemount, Healy’s Bridge and Coachford Junction. there There were two branch lines, one to Coachford and the other from St Ann’s Hydro, near Blarney, which followed the Shournagh valley to Donoughmore. In 1917 the physical railway line was deemed in a good condition but due to the war it was impossible to get timber sleepers. Two years previously, the railway company had placed an order for an engine but owing to war requirements they were unable to obtain the delivery of it. This, according to Mr Colthurst, placed them in a difficulty with regard to the repairing of their rolling stock. The company had been compelled to restrict somewhat their service of trains and were forced to take off the line two of their trains. Financially the company was holding its own. The gross receipts for the company for the year end from all sources amounted to £12,072, as against £11,467 the previous year, which showed an increase of £605, compared with the corresponding period of 1915. Colthurst’s report highlighted that there were great increases in the numbers of boxes of eggs, fowl and butter carried over the line. The chairman noted that “it showed that the people of the country were returning to their old industrial pursuits and producing such commodities in abundance”. Last year the Central Statistics Office published an account of agriculture based on contemporary statistics one hundred years. It denoted that farming was a significant industry for 1915-17 – there were 359,700 farms over one acre in Ireland whilst in 2010 the total number of farms had declined to 139,860 farms, a reduction of over 60%. In 1917 egg production made an important contribution to the rural economy, representing 11% of total agricultural exports from Ireland. Eggs were a consistent source of income and could be exchanged with local shopkeepers for crucial items such as tea and sugar which could not be produced on farms. The care of poultry and the income from eggs was normally a role taken on by the farmer’s spouse. It may have been her only source of independent income. The Department of Agriculture and Technical Instruction introduced initiatives for the improvement of egg production, including the establishment of egg production co-ops. Schemes to improve the breed of hen used and improvements in the packaging of eggs for exports were also introduced. Colthurst at the Cork Muskerry Light Railway meeting highlighted increases in cattle and sheep carried over the Cork Muskerry line – cattle, 696, and sheep, 805 – but in pigs there had been a reduction of 66. The statistics from one hundred years ago reveal that most farms and small holdings kept a cow for milk for the house and liquid milk was not transported over long distances. In 1916, Dairy Shorthorn cattle were the predominant breed of cow used for milk production. Kerry cattle were utilised for milk production in Munster, especially in mountainous areas of Kerry and the Berehaven district of county Cork where larger breeds could not be kept. Kerry cattle were also kept on smaller holdings in Limerick, Cork & Tipperary. In 1916 beef production was primarily to produce live cattle for export. The main beef breeds in 1916 were Beef Shorthorn, Aberdeen Angus, Ayreshire, Hereford and the native Irish Dexter breed. Colthurst in his report attributed the fault of the decrease in pig transport to the bacon curers who only paid low prices “for pork that would not enable the producer to produce pork”. From statistics, he highlighted that the number of pigs slaughtered in Ireland during 1916-17 was a little more than half of the number slaughtered three years previously. However the export of pigs was twice as much as it was three years previously. Many pig buyers took the pigs to England, where they were given a higher price for them than in Ireland. In general, almost 100% of Ireland’s exports in 1917 were to Britain, with Ireland mainly exporting primary products (i.e. products that required little or no processing such as live cattle, raw wool, eggs, etc). Today, the UK takes 41% of Ireland’s agri-export. My book Inheritance, Heritage and Memory in the Lee Valley, Co. Cork (2010) is still available from www.historypress.ie (limited copies). It was based on a series of Our City Our Town columns on the histories and memories of Inniscarra and Dripsey.